MEMPHIS, Tenn. – Memphis 901 FC opened its inaugural preseason schedule with a 2-0 victory against the University of Memphis at the Tigers’ Billy J. Murphy Track & Soccer Complex. Raul Gonzalez scored the first preseason goal in 901 FC history with approximately 10 minutes left in the first half. A good half-turn by Cuban forward Heviel Cordovés to create space for a through-ball sent Gonzalez through for a first-time finish into the left corner. Veteran Junior Sandoval provided the second goal in the final minutes of the match to wrap up a good day’s work for 901 FC, while goalkeeper Scott Levene started in goal for 901 FC and turned in a clean sheet in 45 minutes of action. For Tigers alum Gonzalez, his first game back in Memphis since his college days was an enjoyable one. TAMPA BAY ROWDIES 4, UNIVERSITY OF CENTRAL FLORIDA 2: Dominic Oduro and Kwadwo Poku both found the net as the Rowdies took their second victory of the preseason in a closed-door scrimmage at Al Lang Stadium against the Knights. A pair of trialists also scored for Tampa Bay, which hosts D.C. United next Saturday in the Suncoast Invitational. COLORADO SPRINGS SWITCHBACKS FC 5, PRIDE SOCCER CLUB U19S 1: Mike Seth scored a pair of goals and added an assist as the Switchbacks turned in a big first-half display against local academy Pride Soccer Club U19s. Seth opened the scoring for Colorado Springs off an assist by Rony Argueta before Jordan Burt doubled the advantage with a left-footed shot from 20 yards. Seth added his second soon after, this time turning home a low cross by Ish Jome and then the veteran forward set up Jordan Schweitzer for a fourth before halftime. SACRAMENTO REPUBLIC FC 5, SACRAMENTO GOLD 0: Five different players including newcomer Stefano Bonomo found the net for Republic FC as it took a big victory at American River College. Republic FC’s all-time leading scorer Cameron Iwasa didn’t take long in picking up where he left off last season as he opened the scoring in the 11th minute after a good run and cross by Villyan Bijev. But while Republic FC had chances to add to its lead before the break, it ran away with the game in the second half, Bonomo’s first goal in Old Glory Red arriving in the 68th minute. United States U-18 international Quincy Butler added a third for Republic FC with about 10 minutes to go before Hayden Partain scored the fourth two minutes later. Tyler Blackwood rounded out the victory with two minutes remaining, making a successful return to the side after a season with fellow USL Championship side the Swope Park Rangers. 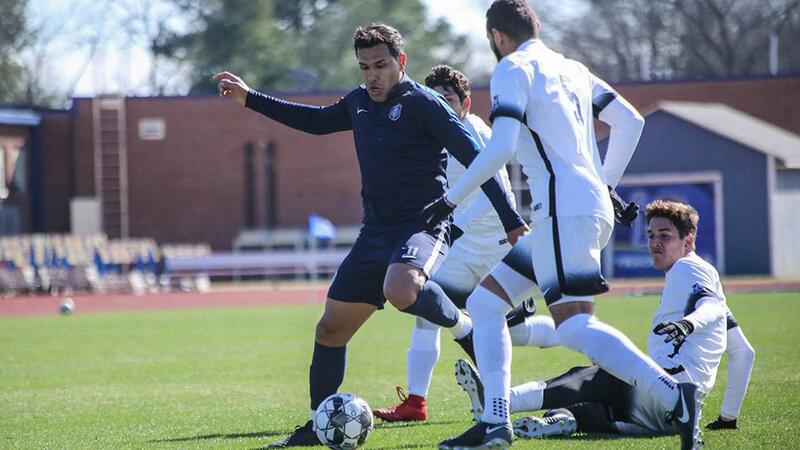 INDY ELEVEN 0, BUTLER UNIVERSITY 0: Indy Eleven was held to a scoreless draw in its first outing of the preseason by the Bulldogs, but had enough chances to have earned a result in what Head Coach Martin Rennie saw as a largely positive start to preseason. 2018 All-League selection Ayoze Garcia had a positive role for the Eleven, setting up teammate Eugene Starikov for a chance in the 12th minute for a shot that went just over and having a chance of his own blocked wide by the Bulldogs’ defense. Making his Indy debut, Dane Kelly also looked bright in the second half with numerous shots skimming over the crossbar or around the post as he went close to celebrating his birthday with a goal.